Hello to each of you who are so caring & interested in Israel’s progress. Today has been a better day for Israel than the past two days. He had a doctors appointment with the surgeon who performed the very first surgery the night of the wreck. The doctor was quite awed at the healing progress he saw in Israel’s legs, & also was impressed at the technique Dr.Smith (the world renown surgeon at Harborview who performed Israel’s final above knee amputation) used to give Israel’s amputated legs added strength for the future.This technique was taking the patella ( the knee cap ), & attaching it to the end of the femur bone. These two will grow together in a much stronger way for weight bearing! We are SO thankful to God for the surgeons he hand picked for Israel, the way He guided their hands & gave them skill, & the way He is now bringing such an incredible healing to Israel’s body!!! We realize nerves are the slowest healing part of our bodies & also that this could be a life long issue, so please continue to pray that the nerve pain Israel is experiencing will be COMPLETELY healed & taken away, so that he can function & live without the pain! Along with the healing process comes a lot of reality of what it means to not have your legs and until prosthetic s to be bound to a wheelchair. The pain he experiences from day to day is still very real and sometimes is unbearable. His pain medication is very expensive and without Medicaid aid right now it is difficult to afford . Please also pray that Medicaid may be approved soon so that Israel can get the help he needs. Both Israel & I thank you for your continued care & prayers!!! 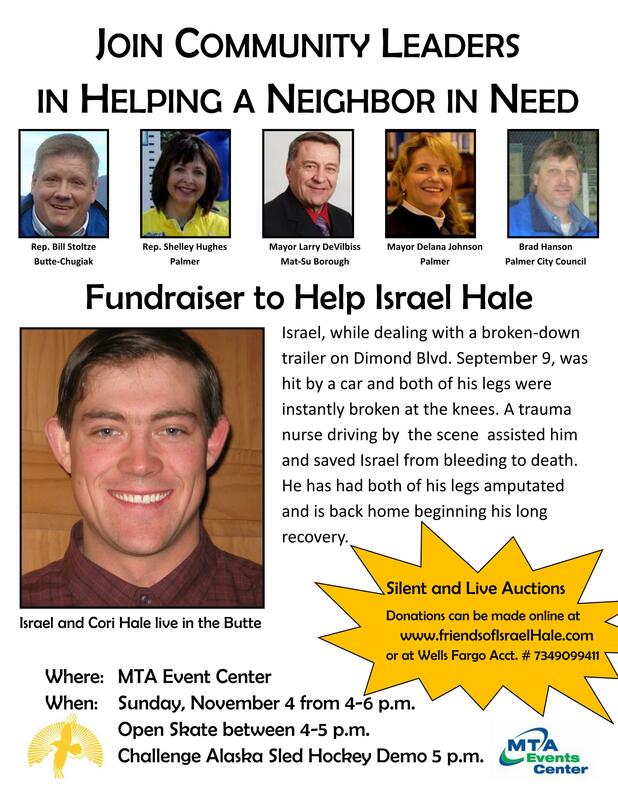 We also want to let all of you “blog readers” know that on November 4th, Sunday , from 4:00 -6:00 PM at the MTA Sports Center in Palmer ,AK, also known as the Palmer ice arena, there is going to be a free ice skating time for all of you who have supported and helped in this situation and time for Israel. Israel would like an opportunity to see all of you and give you face to face thanks for all of your faithful and kind support. He and Cori will be there at the ice rink. This skate will go from 4:00 -5:00 PM. There is going to be a hockey playoff with the Challangers, a group of individual who use ice sleds to play hockey instead of normal hockey at the end . It is a sport that those who have a physical handicap such as impaired legs can use to play this exciting sport. We are also going to have a silent auction to raise money for Israel’s bills . If you or anyone you know has an item to donate to auction off please contact David Hale with your item. Please contact him via email at davidhaleconstruction@gmail.com or call him at 232-3007. Note: These items will need to be smaller or else you can make a flyer of the item for people to see. We invite all to come ! We want to thank Rep. Bill Stoltz for hosting this event and making it possible. ← October 20th, 9:45 PM Israel is Still UP and At It! The glory is to God. I pray Israel will soon be pain free and that you both continue to receive the help you need. Cori and Israel, God is using your testimony far beyond your imaginations. His hand is strongly on your life and this process, every step. Daily, our sons are inspired and blessed at the words of your updates. Heaven will be a glorious time of gathering when God will have you learn the far reaches of your roll in this journey He is carrying you through. I wish so much we could attend the skate night, but we are all out of state as we prepare for a mission trip to the jungles of Indonesia to encourage the persecuted Christians there. (our 3rd visit) We have sent your story ahead and many of the refugees there have prayed for YOU, Cori and your family daily. God has used your life to touch so many more lives than you will know on this side of heaven. Thank you for your faith, your continued love for our Heavenly Father and your trust in His plan. You are constantly and specifically in our prayers. Beloved Cori and Israel: It is a precious thought that you, Israel, will henceforth “walk” on your knees – quite literally – since your patellas will bear your weight, a reminder that, as believers in Jesus, we go forward first by kneeling in prayer. May every day with Jesus be a “prayer-walk” for you both! ♥ Sending you both some more love. Although it seems you are completely surrounded by love in one form or another. Proof that humble beings like yourselves can actually pull the community together because of the love and respect they have for you. Our world needs more people like you.